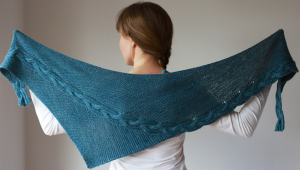 Using simple shaping and a reversible cable, this unusually constructed garter stitch shawl is a perfect piece to throw over your shoulders or wrap as a scarf. The pattern adjusts so it can be worked as small or large as desired. Work it up in a soft shiny yarn and you will be so in love you’ll want to make more than one!